Teachers, parents, students, and community partners collaborated on a renovation of Campbell's interior courtyard into an outdoor classroom that encourages its use in the curriculum while sustaining native wildlife. Teachers have pioneered innovative ways to integrate this accessible and beautiful outdoor classroom into the curriculum. 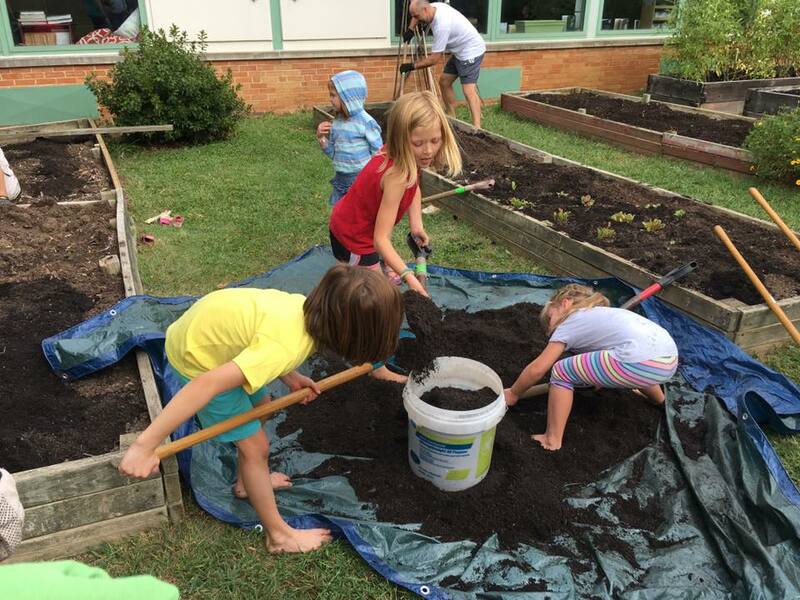 Campbell students and teachers learn outside more often and participate in more hands-on outdoor projects since the multi-year courtyard project was completed. The garden beds are better tended and students are becoming knowledgable gardeners. Students also learn respect for wildlife as they share this space with native turtles and ducks. 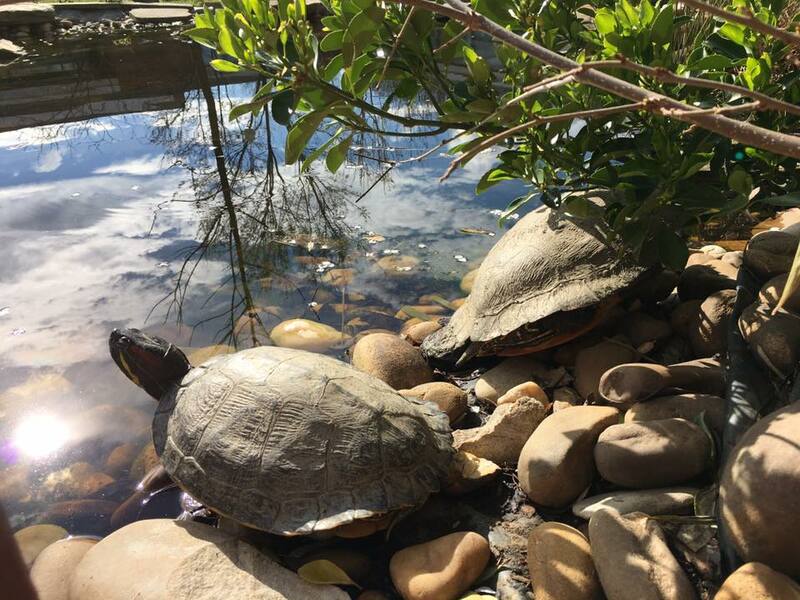 The turtles eat mosquito larvae, keeping the courtyard safe and pleasant for students during the year's hot and humid months. A major PTA project to restore the pond—including temporarily relocating its turtle inhabitants, removing muck, rebuilding it, and installing a new pump and filtration system—has made it a healthy ecosystem once again and for the foreseeable future. Using the greenhouse and the garden beds in the courtyard, students grow and harvest their own organic food, practicing skills they can use to produce nutritious and affordable food throughout their lives. Without the renovation project, that pond likely would have had to be filled in and the turtles permanently moved. The pair of ducks that returns year after year to build their nest would have had to find another protected habitat to raise their young. 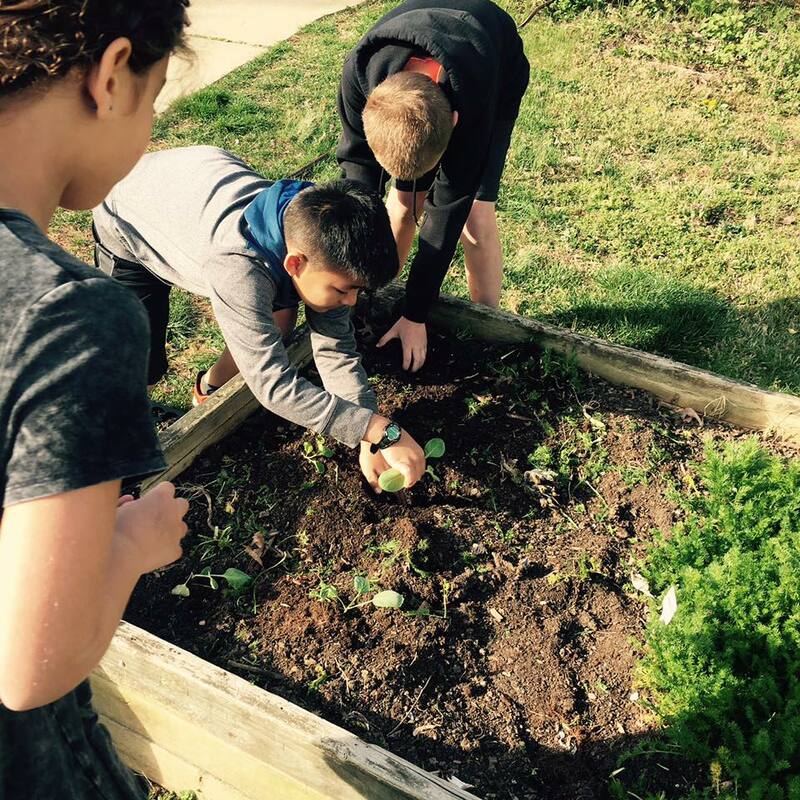 Students try vegetables they grow in the courtyard, which they may not previously have had the opportunity or desire to eat. These greens become a part of their regular diet—parents report they request them at home. Students learn that wildlife should be appreciated, not teased nor taunted. They learn to respect the turtles and give the ducks and their ducklings a wide berth. Students as young as pre-K take an active role in maintaining this common area. They help to weed, turn over cover crops, prune, and water. Sometimes they simply take their lessons into the courtyard to enjoy the beautiful space they have helped to create. They are learning the value of nurturing communal spaces. The courtyard and pond are highly valued by the Campbell community. Teachers have observed that when students are experiencing moments of anger or frustration they request to go into the courtyard. Special Education students use courtyard and pond visits as rewards and motivation. The Interlude program uses the pond as a place to relax and take a break as well as perform jobs. Teachers regularly eat in the courtyard (with and without students) because of its inviting nature. Many students have behavior plans that incorporate feeding the turtles or ducks. The PTA constructed a bridge over the pond to enhance these uses. Students leave Campbell in the habit of appreciating and experiencing nature and the outdoors. They will value these spaces wherever life takes them. Teachers at Campbell use the courtyard daily. It is often used for students to practice observation and writing in a natural environment. They use it to gives students hands-on experiences to help them master standards of learning included in the scientific investigation, life processes, living systems, earth cycles, and earth resources strands. Teachers have integrated the courtyard into the curriculum in innovative ways, for example teaching about simple machines as students participate in transplanting from the greenhouse to the garden beds. In another example, students mapped where water is found and how it is used in the courtyard. They explained that living things need water and gave examples from their courtyard observations. The bridge constructed by the PTA allows for closer observations and observations from different vantage points. Further, the courtyard and its features have been integrated into multiple "learning expeditions" that are integral to the school's EL Education model (formerly expeditionary learning). In one example, students researched what a greenhouse is and planned how to use it. They conducted fieldwork at the Arlington Career Center greenhouse to learn how to make Campbell's greenhouse a success. The expedition resulted in an earlier spring harvest and a student-created guidebook for the greenhouse to help future Campbell students and teachers. Rebuilding the pond- almost done! Have found LOTS of turtles! Turtle transport day! Back to the new and improved pond. Ms. Sim’s class mapped the courtyard pond in groups.